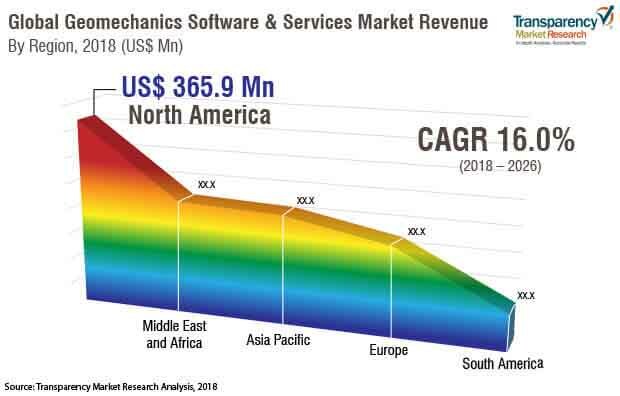 According to a new market report published by Transparency Market Research the global geomechanics software and services market is expected to reach a value of US$ 3,414.3 Mn by 2026. The market is projected to expand at a CAGR of 16.0% during the forecast period from 2018 to 2026. North America is anticipated to be the dominant region in the geomechanics software and services market on account of highest adoption in oil and gas industry across the region.The geomechanics services segment is expected to see flourishing growth due to increasing demand for geomechanics consulting services across different industries. Need for enhanced geophysical and seismic understanding of minefields, oilfields, construction sites, and nuclear waste disposal sites for successful operations across industries such as oil and gas, mining, civil construction, and nuclear waste disposal is the key factor driving the geomechanical software and services market. Geomechanics solutions analyse the rock and soil mechanics of the field area to identify the opportunities and mitigate risk. Capital intensive industries such as oil and gas, and mining, and environmental impact of operations of nuclear waste disposal and civil construction industries demand high level of geomechanical study to manage the costs and to minimize environmental impact. With increasing awareness of green initiatives, geomechanical studies have been gaining prime importance, and thus the use of geomechanics software and services. Request a PDF Sample of Geomechanics Software and Services Market- https://www.transparencymarketresearch.com/sample/sample.php?flag=S&rep_id=44222? The geomechanics software and servicesmarket is segmented based on component, solution type, end-use industry, and geography. According to the research study, the market is anticipated to experience flourishing growth during the forecast period. This is mainly due to increasing digitization in exploration activities in mining, and oil and gas industries. By 2026, the oil and gas industry segment will account for more than 75% of the global geomechanics software and services market due to diverse applications of geomechanics and increasing IT spending in the upstream sector of the oil and gas industry. Reservoir simulation solutions drive the growth of oil and gas industry geomechanics software and services solutions. Geomechanics services segment is anticipated to have more than 64% market share by 2026 due to increasing demand for geomechanics consulting services from service companies. North America is leading the geomechanics software and services market with 35% share globally. This is due to increasing adoption of exploration technologies to gain operational efficiency across industries. In terms of new opportunities, Asia Pacific is expected to witness healthy growth during the forecast period. Rising investments in the oil and gas and mining industries offer significant growth opportunities to the geomechanics software and services market in this region. The research study includes profiles of leading companies operating in the global geomechanics software and services market. Schlumberger Limited, Ikon Science Ltd., Rockfield Global Technologies, Itasca Consulting Group, Baker Hughes Global (a GE Company), Geosteering Technologies, HXR Drilling Services, CGG, and Landmark Solutions – Halliburton, are some of the key players that have been profiled in this study. Details such as financials, strategic overview, business overview,SWOT analysis, and other such strategic information pertaining to these players have been provided as part of company profiling.